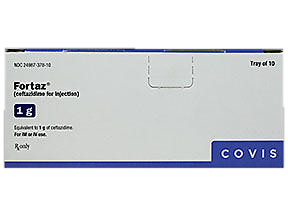 Injectable Cephalosporin Fortaz 1 gram vial. Generic drug name is Ceftazidime Pentahydrate. 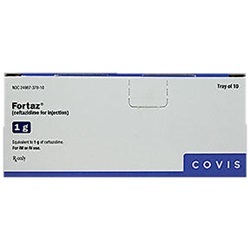 Manufactured by Covis Pharmaceuticals. NDC: 24987-0378-10. Comes 10 vials per box.